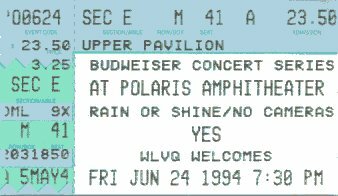 This was another classic Yes show and it was a real treat to see Trevor playing keyboards. I didn't realize he was that good. In truth, I think he's better than Tony Kaye. I had pretty good seats but the sound was not very impressive..it was no where near loud enough. There was talk (no pun intended) that if you had a walkman, you could have turned to a closed curcuit short ranged channel and could hear the concert in stereo though your headphones. I don't know if there is any truth to that but that's what I heard. It certainly would've helped the lack of volume. Chris played a strange looking "stick-upright" bass one one of the songs but I'm not sure which. Just got back from the show in Columbus Ohio (actually got back at 3am) but that's not important :)!! It was an excellent show, the band was as tight as I've seen them (This lineup anyways). The set list was the same as previously listed. All the songs sounded great, Hearts was a WONDERFUL version, Endless Dream was a mind blower almost as good as Awaken was on the Union tour!! My only really gripe would be the loss of Wakeman, which only is REALLY a problem on OLDER YES songs. Trevor was again filling in they keyboards by playing them on guitar :(. This show was MUCH better than the 9012Live or Big Generator shows, but something less than ABWH or Union. Which is what I expected. I'm really looking forward to seeing them again in August to see how much the set list changes (if at all), and to see if they play with as much enthusiasm. I give it an 8.5 out of 10 (with ABWH a 10, and Union a 9.5)!